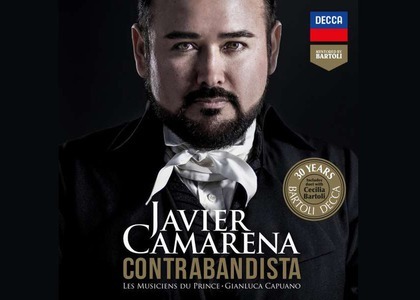 Javier Camarena’s newest album, “Contrabandista”, for the first time at Radio România Muzical! "Contrabandista" is the name that Javier Camarena has chosen for his most recent album. The album was released two months ago, on the 5th of October 2018. It is the Mexican tenor's firsy collaboration with Decca Classics. Even more than that, the album brought on another collaboration, with Cecilia Bartoli, who served as a mentor in the making of this album, eventually deciding to integrate it into a series celebrating her 30-year partnership with Decca Classics. The diva's contribution to this album is "Amor...Possente Nome! ", a duet from the opera "Armida" by Gioachino Rossini, which she recorded with Camarena. "Contrabandista" is an album about the legendary Spanish tenor, Manuel Garcia. "I have always wanted to do a project about Garcia", explains Cecilia Bartoli in the album's official trailer. "And then I was thinking... whom can I do this with? I know! I thought about you!" were the words of Cecilia Bartoli while talking to Jaiver Camerena. "I was thinking about you, Javier because you have this incredible musicality but also flexibility and this is what you need to perform this music, which was written for Garcia, but also... for you." About Manuel Garcia, Cecilia Bartoli goes on to say: "he was the tenor of that time, of the 19th century. Rossini composed operas for him, for his voice." Following the footsteps of Manuel Garcia, Javier Camarena also included works of the famous Spanish tenor and composer on the album, three of them in debut, next to several operas of Gioachino Rossini and Niccolo Antonio Zingarelli. Aside from Cecilia Bartoli, Javier Camarena also collaborated with the brilliant recently formed ensemble "Les Musicians du Prince - Monaco". The musicians, led by Gianluca Capuano, bring extra authenticity by playing old instruments.